The Mumbai Police's social media account is known for their witty tweets giving out important messages. Mumbai Police Twitter uses funny videos and pictures from time to time giving out different messages or for social campaigns. In their latest tweet, they spoke of traffic rules by posting a funny viral video of a turkey blocking the road to let other turkeys cross the road. The video is from North Hampshire and was shared on social media last week. Since then, the video has been appreciated by people everywhere and Mumbai Police found a message to give along with it. Mumbai Police’s Dig at Hardik Pandya and KL Rahul’s Koffee With Karan Controversy Is Beyond Quirky, Reactions Win Twitter. We should probably take a lead from the turkey who has stopped the traffic. 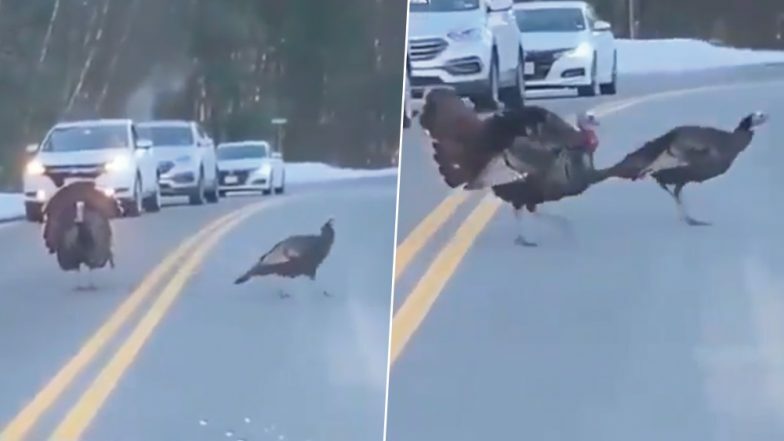 This video was captured at Litchfield, New Hampshire, shows standing in the middle of a two-way street, until other turkeys pass by to the other side. Once the last turkey crossed the road, it followed it. People on Twitter have given some funny reactions to this tweet. Bye Bye, for now we'll meet you at Thanksgiving on your dinner table! Well, the situation is mostly reversed in our country, when even despite busy traffic, people show their hands and make way through while crossing the roads. Some people even voiced the same concern. It is indeed time we learn a thing or two from this turkey video when it comes to traffic rules.